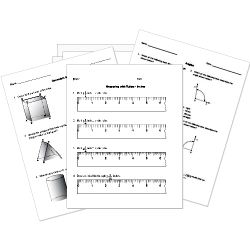 You can create printable tests and worksheets from these Trigonometry questions! Select one or more questions using the checkboxes above each question. Then click the add selected questions to a test button before moving to another page. [math](-4pi)/3[/math] is equivalent to which of the following? If side [math]AB = 15[/math] and [math]ang C = 38 deg[/math] What is the length of [math]AC[/math]? If AC is 15, AB is 17, and BC is 8, then find [math]cos(B)[/math]. In the triangle PQR, sin(P) = 0.2, sin(R) = 0.4 and r = 22. Find the length of p.
If side [math]BC = 9[/math] and [math]ang B = 23 deg[/math], what is the length of [math]AB[/math] ? If side [math]AB = 15[/math] and [math]ang C = 38 deg[/math], what is the length of [math]BC[/math] ? In triangle ABC, angle A = 61°, angle B = 47°, AC = 7.2 cm. Find BC. If [math]sin(theta)=7/25[/math], what is [math]tan(theta)[/math]? Secant is the reciprocal of . The Law of Sines and the Law of Cosines can be used for right triangles as well as oblique triangles. In a 30-60-90 triangle, the length of the hypotenuse is multiplied by the shorter leg. Which trig function(s) is/are negative in the second quadrant? What is the period of the cosine function? In a 45-45-90 triangle, the hypotenuse is the leg multiplied by .